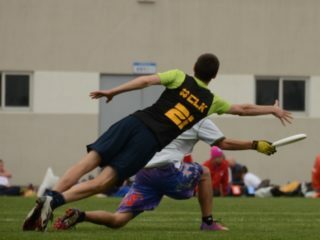 I watched some men’s ultimate this past weekend at Cascadia Conferences. I was surprised by how many blocks they left on the field, particularly on deep throws. I started thinking about why this would happen – the games I was watching were intense, the players motivated and athletic. The first thing I reminded myself of is that defense is actually harder to learn than offense. You can be okay on defense pretty quickly if you are motivated and athletic, but to be great takes learning how to react to a million different little situations. The college men’s division as a whole is a great example of this because the offenses are developed and sophisticated beyond where the defenses are. 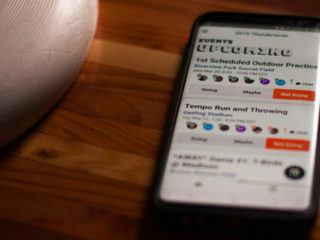 Once players transition into club ultimate, the defenses begin to catch up. I don’t think the defenders this past weekend even knew that the block was a possibility – they couldn’t see where or how to get it. I was also reminded of the importance of the nitro, as each of these missed blocks required closing a one- or two-step gap over the last twenty steps before catch. Like all athletic ability, nitro can be trained for and improved, but it’s not just speed. 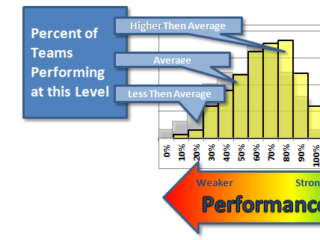 Most deep cuts begin at 90%; if you recognize a step early and go to 100% there, you’ve made up ground. Most deep cuts curve in response to the disc; out-read the offense and take the straight line and you’ve made up ground. I’d highly recommend it as a skill for defenders, particularly if you cover cutters a lot. I was also reminded this past week of how much one little thing can tip an entire system. We were running a defensive drill at practice recently and it wasn’t working quite right. It wasn’t effort or focus or understanding. It just wasn’t working right. When this kind of thing happens, I usually quit giving feedback for a bit and just watch, trying to see and not look. After a bit I thought it was where our eyes were, so I stopped the drill and told the where their eyes should be. That still didn’t work. Eyes weren’t in the right place, but why? Then it came to me – our hips were turned wrong. Discussed briefly, adjusted, fixed. Drill runs smoothly. It is so often the case with the things we are trying to do in ultimate are susceptible to one small change. This is true of drills, pull plays, zones, marking, team culture…everything. The challenge is finding that one thing. It’s partly experience, but it’s also process. The trick is to see without looking – looking blinds you to everything you aren’t looking for. If you aren’t sure what’s wrong, you often have to let things run wrong while you observe. The change you are looking for is small, simple, easily enacted and flips things over a tipping point. Alright, time to talk bids. The conversation around the Northwest’s six bids has continued to rage. Like a lot of online arguments, it’s gone back and forth and covered a lot of ground in a random, emotion-fueled manner. There’s no question that six bids are too many for one region, but the six bids are a symptom, not a cause. Any attempt to address this should focus on the root cause: the underdevelopment of girl’s ultimate. The ratio of girl’s to boy’s participants is far worse than similar ratios in the college or club divisions. That Seattle and Vancouver have built incredible youth programs shouldn’t be penalized, but celebrated. That is the path going forward for everyone. You can’t quantify or legislate advantage and disadvantage – it’s a brutal Pandora’s box of horrors. Hack raised the time zone issue. Does this mean that the NW teams should get a two or three point head start in all of our Nationals games? What about the weather issue? The NC and NE suffer horribly every year. Maybe they should get an extra bid for every foot of snow on the ground in March? What about the five years of eligibility? 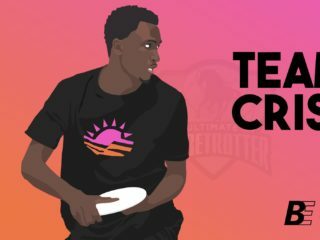 In the 25+ year history of Carleton ultimate there have been fewer than ten 5th-year players for CUT and Syzygy combined. Something that should be discussed is how awful the new system is for teams on the bubble. Teams that are assured bids and teams that are guaranteed not to get them can work for Regionals, but the bubble teams have to scrap and claw the whole way. Right now this problem is consistently the worst in the NW, SW and AC but other regions will float up and join the issue from time to time. I think the overall problem is even harder on the men’s side of things where there are even more teams that are good but not great. I have a solution that will ease the issue somewhat – 24 teams to Nationals. On the women’s side, that’d add bids to the AC, NE, SW and SE. The men would get 2 for the NC and one apiece for the SW and NW. Given the relatively short shelf life of a lot of teams, more spots at Nationals is a really great thing. Of course, this only moves the issue down four spots but the current state of ultimate warrants the inclusion. There’s no perfect-forever size; back in the 90s twelve was almost too many teams. USAU is flexible and adaptable in a slow way – start bugging your representatives and regional coordinators about it. Someone start tweeting about it. Be pushy. There is something else that really bothers me about this debate and discussion – the idea that the teams in the NW or SW haven’t earned their bids or don’t deserve them. This is insulting to the hard work and sacrifice these teams have put in this year and in past years to give themselves a chance to go to the show. Victoria’s travel troubles are pretty well documented, but perhaps not very well understood – they have to cross an international border to play. That’s worth $300 a player each and every tournament. The Bruleigh’s have put years of work into building this team from one that can barely field seven to Nationals caliber. My first year coaching at Oregon (2008) we beat Western Washington in the game-to-go. Their best player at the time? Current coach Alyssa Weatherford. She and the rest of Western have been fighting with typical scrappiness ever since. Anyone who’s watched last-team-in UCLA this year has seen that their success is largely due to UCSD transfer Michelle Chang. She played NW Challenge with a broken foot. So you can say that the system is broken or unfair or that the West got too many bids. Fine. But don’t say that these teams didn’t earn the bids. Don’t disrespect their work.